The way books are made—that always excites my curiosity. The seminal American poetry collection Leaves of Grass is a book Walt Whitman not only wrote, but also realized as a physical object. Between its first printing in 1855 and the final deathbed edition published in 1892, Whitman produced six uniquely typeset versions. In addition to modifying the content—the total number of poems grew from 12 to 400—he focused on the smallest physical details of his books' design and production, relying on his training as a printer, typesetter, and binder. While self-publishing was not wholly uncommon at this time, as scholar Ed Folsom states, Whitman is the only major American poet of the 19th century to have such an intimate relationship with the craft of bookmaking, an artisanal awareness which, in turn, influenced his poetry. The exhibition includes approximately 100 books by 56 authors, primarily writing in English and based in the United States, Canada, South America, the UK, and France. Publication dates range from 1930 to the present, the earliest book being a first edition by Gertrude Stein (Lucy Church Amiably). Despite the eclectic, international selection, the exhibition is grounded in examples by writer-bookmakers associated with Philadelphia, including Andre Bradley, Robert Blackson, Randall Couch, Marianne Dages, Ditta Baron Hoeber, Mark Francis Johnson, Jayson Scott Musson, Nicholas Muellner, and William Pym. Ditta Baron Hoeber and Marianne Dages—who runs Hulga Press, her own imprint—are represented by books for which they not only wrote every word of text, but also executed every detail related to their physical manifestation. Their examples represent the extreme of a continuum that ranges from solo efforts of writing, typesetting, printing, and binding—such as Sarah Nicholls’ letterpress pamphlet about climate change or the photocopied zines of Matthias Connor—to include variants of close collaborations with publishers, editors, printers, and designers. Regardless of these permutations, each book included was selected to reflect Whitman's own agency within the production of his evolving editions of Leaves of Grass. Contemporary readers may not be aware of what a radical object Whitman’s book was at the time of its initial reception, thanks, in part, to its success as a work of literature. The first edition, printed on large ledger-sized sheets, featured an elaborate blind-stamped cover that intentionally withheld the name of its author, who is nonetheless depicted in an engraving on the frontispiece as what one critic referred to as “a perfect loafer”. The second edition, “shaped like a small atlas”, is printed on sheets less than half the size of the first. The third edition, in addition to adding the controversial Calamus poems, finally included the author’s name on its title page. Independent of its content, Leaves of Grass was regarded in its own time as an unusual object, “odd and out of the way," “preposterous, yet fascinating." Some of the examples in the exhibition address Whitman’s bookmaking practice directly, such as Barbara Henry’s Walt Whitman’s Faces (2012), a letterpress edition of his poem "Faces" (1855) inspired by the diverse assortment of fonts the poet employed the 1860 edition of Leaves of Grass. The work’s play on the word “face”—as referring both to human faces and to typefaces—becomes the key to the “typographic reading” that Henry offers: “In this poem” she writes, “Whitman plays out a central metaphor of printshop vocabulary, that the sort, or individual piece of type, is a man.” Elisabeth Tonnard’s Song of Myself (2015), a humorous pocket book, constructs its satirical commentary by aligning the reference to Whitman’s paean to the self with our over-reliance on social media as a means of sharing the minutiae of life. Robert Blackson’s If There Ever Was: A Book of Distinct and Impossible Smells (2008) employs hand-tipped, scratch and sniff sheets sampling 14 extinct and impossible scents—including the smell of the sun, Cleopatra’s perfume, and “communism”. Considering the olfactory as integral to the perception of abstraction and representation, Blackson’s book serves as away to point to the sensual, earthy dimension of Leaves of Grass while also echoing its physicality. These and many other limited edition books by small presses are joined by examples released by more mainstream imprints in much larger numbers. These include Mullholland Books’ elaborate realization of Doug Dorst and J.J. Abrams S (2013) or Pantheon Press’s House of Leaves (2000) by Mark Z. Danielewski, who designed and typeset the book using special software at the firm’s New York Headquarters. The result of these and other efforts by writers such as Jonathan Safran Foer, Wayne Koestenbaum, Brian Selznick are experimental novels featuring an intricate blend of typographical and material ingenuities that create correspondences between page layout and physical spaces within the narratives themselves. Interspersed throughout the gallery are historic works such as Julio Cortazar’s Hopscotch (1963), a fragmented narrative by the Argentine author who offers a second reading of the book according to a preordained, nonlinear sequencing its 56 chapters. Madeline Gins’ Word Rain (1969), a touchstone of innovative prose saturated with words, both physically and symbolically, works to blur the demarcation between subject and object, theme and subject, the reader and the writer. Kenneth Patchen’s Sleepers Awake (1946) is distinguished by illustrations, graphics, word pictures, puzzles, and variations in font size that anticipate meta-fiction and concrete poetry. These are joined by a posthumous edition of William Faulkner’s The Sound and the Fury (1929), published in 2012 by the Folio Society, London. By using individual colored type to explore the 14 different timelines in the novel’s first section, the edition attempts to convey Faulkner’s original intentions for his book. Regardless of its hypothetical nature, the edition serves as a testament to the impulse of writers to exert creative control over the materialization of their texts, an instinct expressed fully by Whitman’s Leaves of Grass. 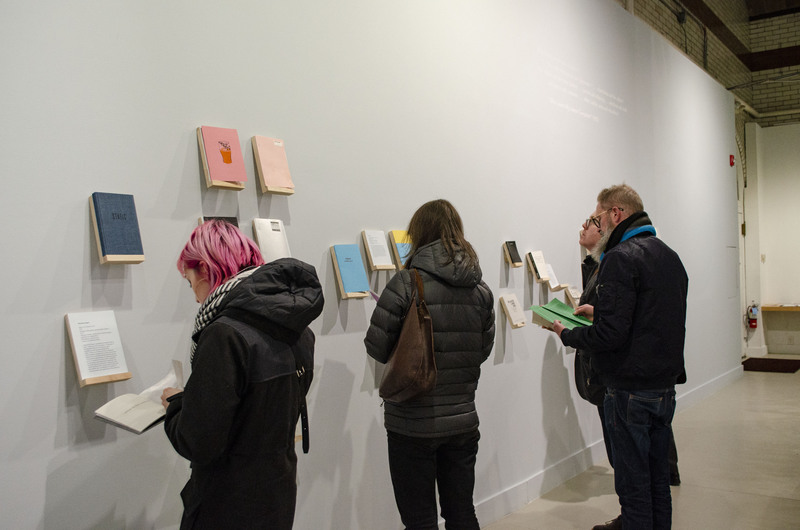 Given that the framework established for the exhibition is inevitably hybrid and complicated by the fluid semantics and nuances of the specialized skills associated with bookmaking—which to a large extent, even in our era of self-publishing and the increased recognition of “artist’s books,” generally remain a collaborative endeavor—the exhibition is not intended to suggest a definitive or authoritative selection. Mindful of this, we invite visitors to suggest other titles for inclusion in the show, which we will share with the public on the gallery website and in the gallery itself. M.T. Anderson & Eugene Yelchin, Fiona Banner, Peter H. Barnett, Robert Blackson, Andre Bradley, H.R. Buechler, Sophie Calle, Francesca Capone, Anne Carson, Paul Chan, Matthias “Wolf Boy” Connor, Julio Cortázar, Randall Couch, Simon Cutts & Erica Van Horn, Marianne Dages, Mark Z. Danielewski, Lydia Davis, Alex Mackin Dolan, Doug Dorst & J.J. Abrams, William Faulkner, Jonathan Safran Foer, Maryam Monalisa Gharavi, Madeline Gins, Karen Green, Heather Guertin, Steven Hall, Barbara Henry, Pati Hill, Ditta Baron Hoeber, Luisa A. Igloria, Mark Francis Johnson, Kevin Killian, Wayne Koestenbaum, Richard Kostelanetz, Warren Lehrer, Woody Leslie, Johanna Maierski, Nicholas Muellner, Jayson Scott Musson, Sarah Nicholls, Olaf Nicolai, Kenneth Patchen, Megan & Rick Prelinger, William Pym, Morgan A. Ritter, Colin Sackett, Brian Selznick, Gertrude Stein, Rose Smith, Athena Tacha, Nick Thurston, Elisabeth Tonnard, Lisa Wigwam, and Walt Whitman. Click here to read Edith Newhall's Feb. 24 Philadelphia Inquirer review of "Writers Making Books". (Note: it is the second review in this link). 108 pages, 8.25"h x 6.13" x 0.5"
48 pages, 8" x 6" x 1"
17 pages, 10.75" x 7.25" x 0.5"
144 pages, 9 1/4" x 6 3/4"
Installation view of "Writers Making Books".